Disclaimer: I was given both the fabric and the PDF sewing pattern free of charge by Olgalyn of O! Jolly! in exchange for sewing it up and sharing my make. All opinions stated in this review are my own. I’ll be honest with you guys. If someone offers me free fabric to make something, I’m probably always going to say yes, just as I’m probably always going to say yes to a cup of tea or a glass of wine. However, I will confess to being a bit exceptionally excited about discovering O! Jolly! knits. I’m probably going to rave a little about them now (and the Megan longline cardi pattern too, by the way). I want to give you a little background as a reference point for my excitement. Firstly, I do not knit. Nope, not at all. I’ve tried countless times. My most determined effort produced a few beanies two years ago and a disgraceful, but much loved tunic. I do not like knitting. I tried really hard to like it, but I just don’t. I’m a sewer/seamstress/sewist through and through. I do, however, LOVE knitted garments. I think they are just amazing. If I had the skills and patience, I’d definitely be rocking fancy, knitted sweaters each Winter. Quite possibly, the most loved garment I’ve ever made was made using a sockinette stitched, Italian, pure wool fabric. The irony was not lost on me that the fabric was constructed using the one and only knitting stitch I can do. 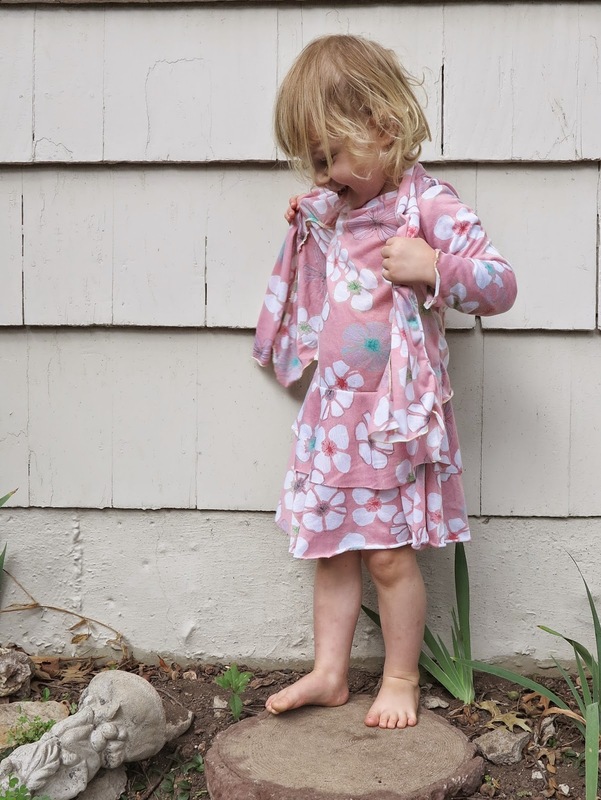 And that fabric was expensive, but my daughter wore that cardigan intensively for three Winters and has only just (very reluctantly) passed it on to her younger sister. I used a Japanese pattern and would love to make another for her, but it is not the type of fabric I see very often, especially not online. In fact, when I first browsed the O! Jolly! website, my first thought was of that cardigan with the intention of sewing it in a larger size. But it is Spring here in Kansas City and we are fast approaching Summer. Wool season is long gone, but the weather is still irregular with hot days interspersed with cool rainy days. I needed a cardigan for myself and I knew the Megan would be perfect for Spring and Fall if I used a cotton knit. I selected the sewing pattern and Olgalyn was very helpful in advising whether the knit I chose would be suitable for the project. In fact, she has a Pinterest board that is devoted to sewing patterns that would suit her knits. I was very close to sewing Jalie 3248 but I’ve had my eye on the Megan for a while now. I’m not sure that my photos showcase the great hem of the Megan. But like all Tessuti patterns, this one is thoughtfully constructed. There are only three pattern pieces to this cardigan (excluding the binding), so the design is simple, but it is the little things that make it special, like a hem with mitred corners and seamlessly finished edges where the binding and hem meet. I should probably also note that I was excessively careful about not stretching this knit as I sewed it, particularly at the sleeve edge and hem. I used a lightweight fusible web to adhere the hem allowance in place before I stitched it down (with a single, not a twin needle), and then I steamed it heavily with the iron to bring it back to it’s original shape. Let’s talk about this fabric though. I ended up selecting the Saratoga knit in natural white. This is a beautifully soft cotton that has been ginned, spun, and knit in the USA. It has not been dyed or bleached. In fact, it would make the most gorgeous baby clothes, or even simply, a blanket. Let me tell you, when my yardage arrived, it looked so beautiful uncut that I was tempted to bind the ends and keep it as blanket myself! The knit was very easy to work with. I prewashed it in warm water and dried it in the dryer. I usually pre-treat my fabrics as aggressively as I dare (just in case they end up in the wrong wash). Even so, I’ll still launder the finished cardigan gently, but I won’t have to worry about any further shrinkage (if my 4-8yr old laundry sorters are off their game). I can’t tell you how much this fabric shrunk with the pre-wash. But it is a knit and I would expect some shrinkage with any knit, just as I would with many other fabrics I use. In the end, three yards delivered me a very long Megan with not much to spare. I did need to seam the binding a little right near the bottom of the cardigan. If you look closely, you can see slight lumps where those seams have been joined. I absolutely love my new Megan. It turned out even better than I imagined. I cut a size small and made only a few small changes to the pattern. I added a 5/8 inch wedge to the CB (my standard broad back modification). I also added 2 inches to the sleeve length and body length (because I’m tall and I doubt that anyone drafts for 5″10). I decided to cut the back on the fold instead of sewing the CB seam because I could just fit the pieces on my folded fabric. The Megan was perfect for this fabric. It showcases the texture of the Saratoga knit beautifully. I actually planned on using the reverse side of it for the binding (but I forgot!). I’m going to get a lot of wear out of this new cardigan, during the next few weeks but more likely during Fall now. It is warm and snuggly without being overbearing. The fabric lends a nice weight to the design so it hangs beautifully (but I’m also very glad I reinforced the shoulder seams with clear elastic like the pattern instructions recommended). At the end of the day, I cannot recommend O! Jolly! knits highly enough. I know I was lucky enough to receive this yardage for free, but I’m planning to return as a paying customer at the end of the year. The possibilities are endless! 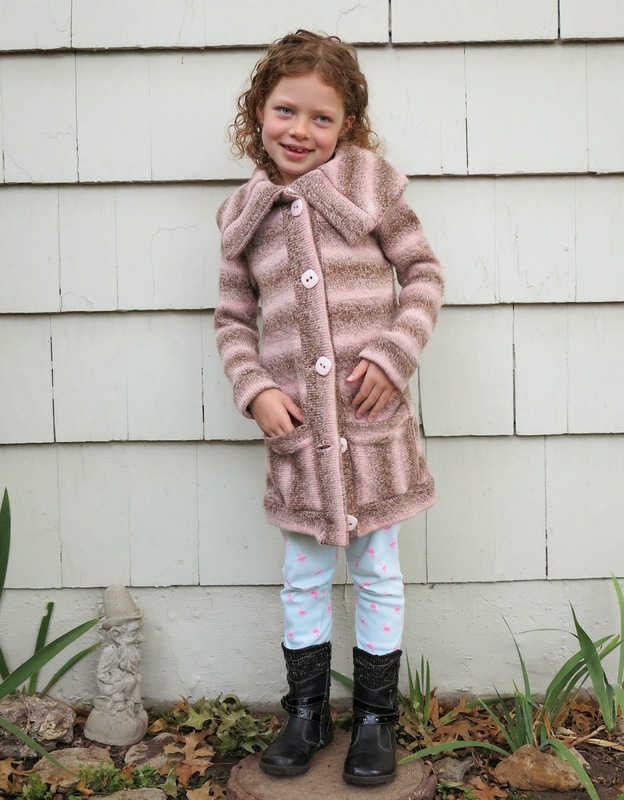 This entry was posted in cardigan, coat, cotton, white and tagged cardigan, cotton, knit, O! Jolly!, Tessuti patterns on May 26, 2016 by Debbie Iles. I quite liked the idea of a long, graduated hem for this coat when I first made it (even if the husband was quick to tell me that the shape reminded him of the wings of a cockroach). Even so, after wearing it a few times, I started to find the length in the back annoying, particularly as I could feel it against my legs as I walked. I’m also quite excited about the piece of fabric that I chopped off. I think it might be the perfect shape to turn into a capelet or bonnet for one of my little peeps. This entry was posted in cardigan, coat, jacket, Japanese pattern books, leather, leggings, pants, Tessuti Fabrics, wool on December 19, 2014 by Debbie Iles. Let’s talk about fabric shall we. Now I am definitely not an expert in textiles. Everything I’ve learnt has come from my experience with sewing. When my youngest was just a baby, and I was just learning to sew, we were living in Sydney, and not too far from what is historically known as the garment district. Anybody who has a small baby knows that mums need to get out of the house. Once I moved beyond foraging at Spotlight (the equivalent to Jo-Ann here), my favourite weekly outing with bubs became a trip to Tessuti Fabrics. Every now and then, I threw in a trip to the Fabric Store for good measure, but my regular haunt was Tessuti’s, and not just for the fabric, but also for the great staff, and of course, their most fabulous of fabulous remnants table. I didn’t always walk away with a purchase, but I would walk up and down those walls of fabric, dreaming, feeling and learning about amazing textiles. I also spent a fair bit of time rummaging through their remnant table to find fabric gems that are were discounted by 40-50%. I picked up LOADS of amazing remnants during my time in Sydney; the softest wool jerseys, silks, printed linen, and lots of ponte knits. 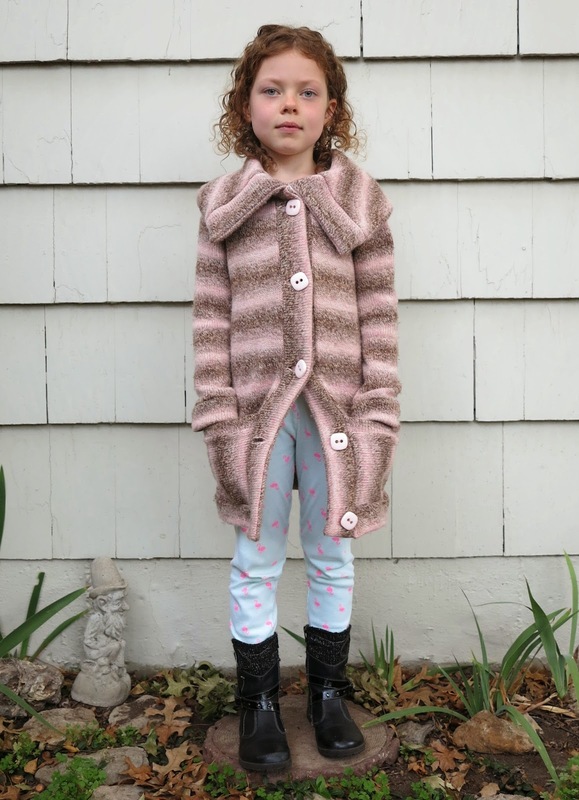 I also picked up this heavy-weight, striped, pure wool knit that I turned into a coat for Miss Six. I made this coat more than 18 months ago, well before I started blogging. I took these pictures a few days ago. Past Debbie didn’t know much about interfacing or turn of cloth so the collar could certainly be improved. But even so, the jacket has withstood the test of time. 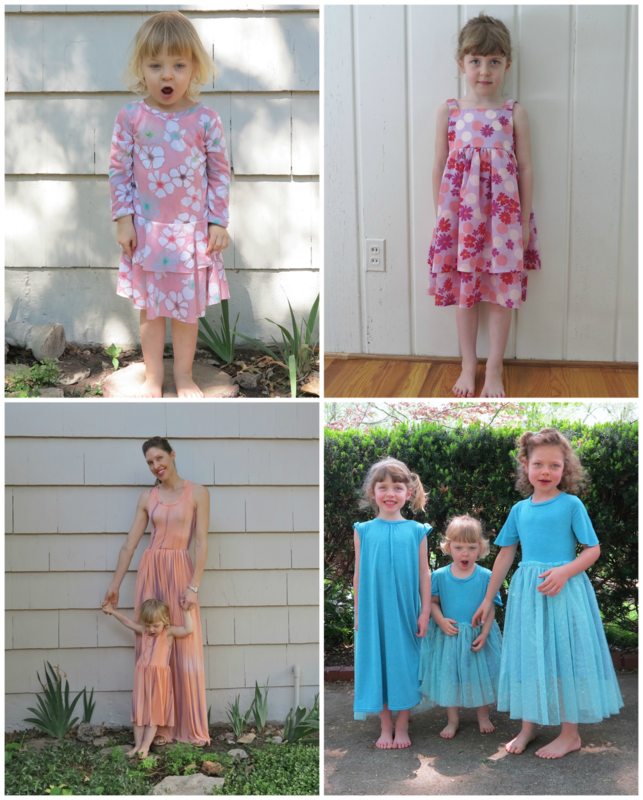 I used a pattern from one of my Japanese Pattern Books (Neat and lovely girl’s dresses by Yuki Araki). It is such a lovely design and Miss Six simply adores it. It’s probably the absolute favourite thing that I’ve ever made for her. She wears it every day in cool weather. If it weren’t so cute, I’d be sick of the sight of it by now. I wash it on a gentle machine cycle, as infrequently as possible, and it still looks and feels as good as new. The fabric wasn’t cheap but it is clearly robust enough to withstand the activities of a school kid. It hasn’t pilled like a poly blend wool. It hasn’t faded, felted, shrunk or stretched out of shape. It’s in such great shape that it will likely be passed down to my middle girl next. At nearly $60 a pop (or should I say metre) the price of this wool fabric will make some people cringe. I was lucky enough to pick it up for about half this, but it would have been worth every penny at full price too. So thinking about this coat had me thinking about how I evaluate the cost of fabric. I’m going to disregard quilting cottons for a minute, because they are always going to be fabulous value for wear. I’ve also experienced some great longevity out of budget corduroy. But when it comes to knits and wool fabrics, there is something to be said for purchasing quality, natural fibers. Yes, they cost more, but in my experience, they are a lot more comfortable, they look better for longer, and they are often well and truly worth the amount spent. I’m still seduced by cheap synthetic blend fabrics on occasion and I probably always will be, but I mostly live to regret it. Sure, I might get a few wears out of the item, but within weeks it’s often terribly pilled or felted, and ready for an early retirement (in our house, this means they get sent to the dress up box, my clothes included). I can’t stand pilled clothes. I did a little stocktake recently and sadly, these dresses are already out of commission. I’m guessing there’s at least $60 worth of fabric in all those dresses combined. If it weren’t for the enjoyment the dress up box brings and the fact that I enjoy sewing, I’d be thinking that this time and money could have been better spent. This entry was posted in cardigan, coat, jacket, Japanese pattern books, Tessuti Fabrics, wool on October 23, 2014 by Debbie Iles. For the past few months (apart from multiple, transient costume changes each day) Miss Two has really only been wearing two dresses (here and here). Apparently they are both suitable for nightwear as well as daywear. Who am I to argue with a two year old? Day in, day out, night in, night out, we see her in the same clothes. I think it has a lot to do with comfort and a little to do with the fact that they are dresses she can slip on herself (and therefore slip off for her costume changes). Hubby and I held a meeting. I was going to make those dresses disappear. Miss Two and I went shopping at Jo-Ann. She found some very pretty (polyester, ugh!) jersey and I found Simplicity 1435. I feel like I don’t sew Simplicity patterns very often so I was going to treat this as a wearable muslin. 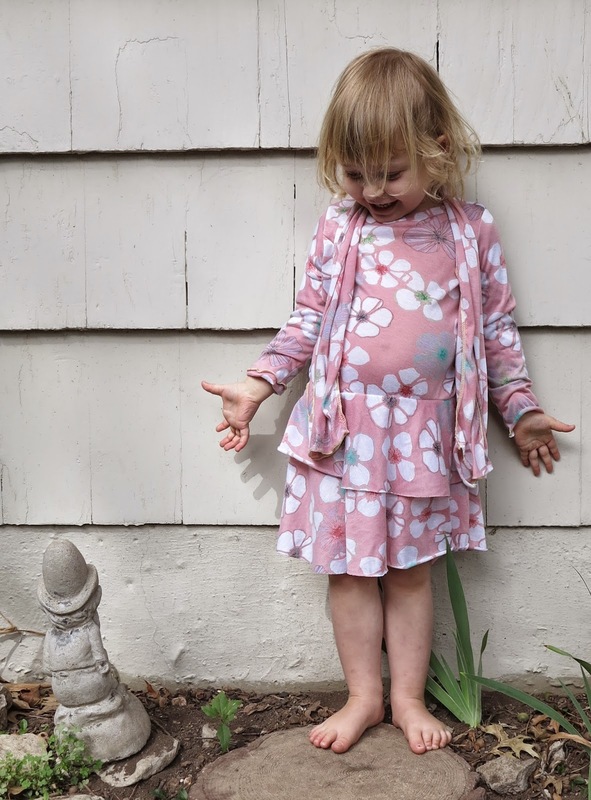 I’ve rarely been super impressed with the fit of kid’s clothes from the big pattern companies. But this could be because my older two girls are a lot longer and narrower than average. Miss Two (AKA Midget) is completely average in size (not temperament!). She is smack bang on the 50th centile for everything, despite being dwarfed by her giant sisters. Not surprisingly, this little dress pattern fits her perfectly. The only change I made was to lengthen the sleeves for Autumn and shave a bit of the sleeve cap. I also left the hem unfinished. I love the unfitted, drop waist look and it is clearly very comfortable. The dress has thankfully become her new favourite and the other pilled and shredded dresses have disappeared unnoticed. 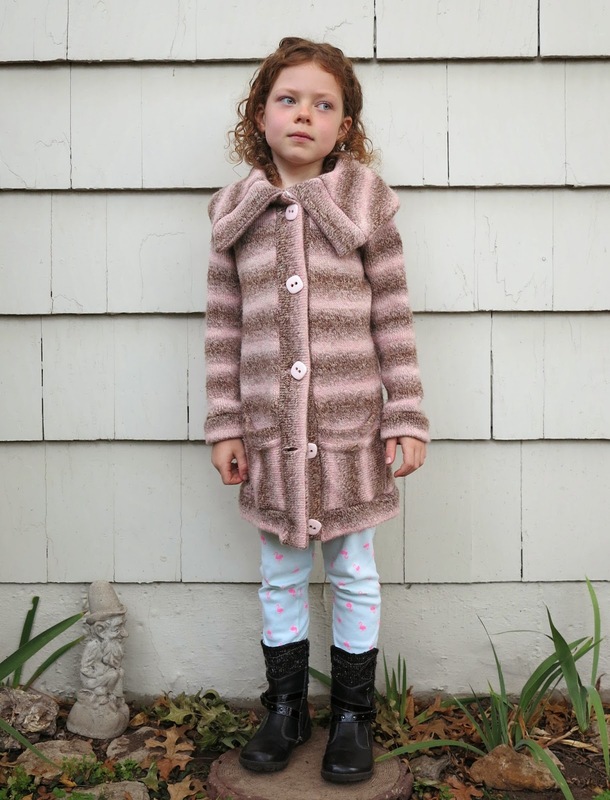 I also made her a Swoon cardi to go with her new dress. 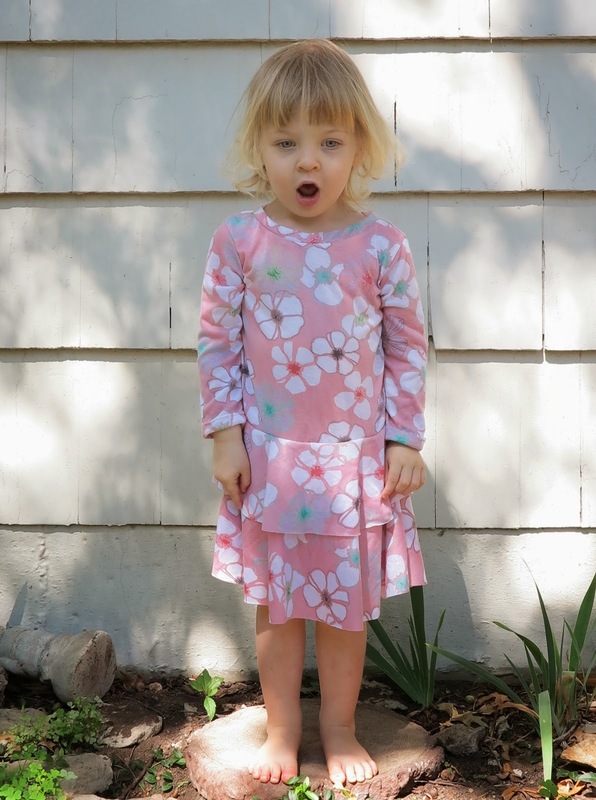 A little while back, Lara from Thornberry blogged about a very pretty matchy make for her daughter. I loved the look of her Swoon cardi so I made sure I had enough fabric to make Miss Two one too. I had my doubts when I was putting this pattern together. I was so tempted to redraw a few pieces to somehow turn the shawl collar into a self-facing edge but it all started to hurt my brain too much. I was having trouble seeing how it would come together in the end. But I ploughed on and did a quick hash job of serging the edges in non-matching thread because I truly didn’t think this cardi would turn out as well as it did. Gnome found his way upright again, but not for long. So now I’m going to step on his head, because that’s what you do to gnomes. Miss Two put the cardi on straight away and has barely taken it off since. I even caught her wearing it scrunched up underneath a long sleeved top this morning. The fit is beautiful. The shape is pretty and the lightweight fabric worked very well for it. I will definitely give this pattern another go but with better fabric next time, and nicely hemmed edges too. Sorry gnome. Let’s be friends again? 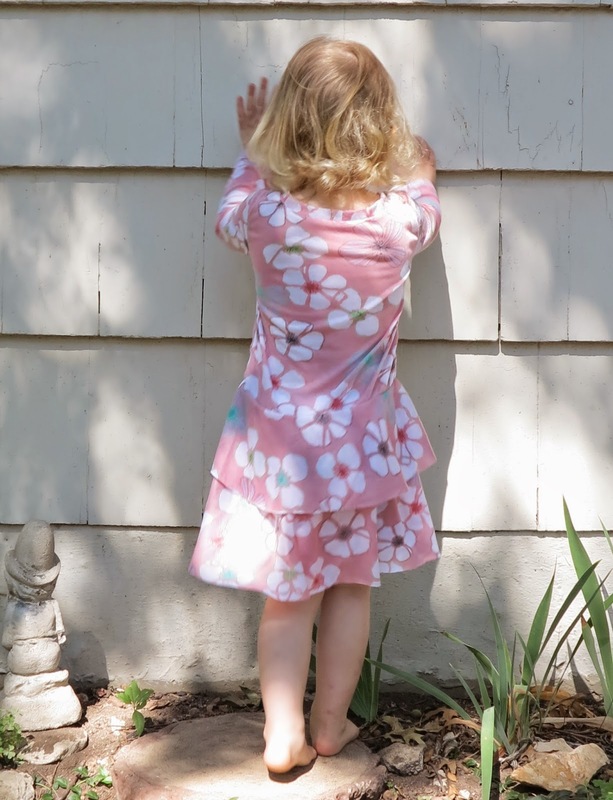 This entry was posted in cardigan, dress, jersey, Jo-Ann, Simplicity 1435, Swoon patterns on September 21, 2014 by Debbie Iles.